Contractual relationships rule the day. That's the real lesson in performance surety work. 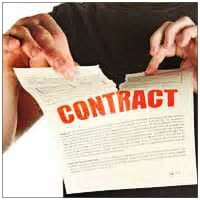 It's all about how the contracts are worded and whether the parties adhere to the contracts. In the article below, the contractor was unhappy with the water board because they did not extend the time limit, per the terms of the contract. See our Tumblr page here. A construction company is suing the Sewerage & Water Board for breaching contract in several ways and failing to pay the proper amount for work completed. W.L Wyman Construction Company, Inc. filed suit against Sewerage & Water Board of New Orleans in the Orleans Parish First Civil District Court on June 19.The plaintiff claims that it entered into a contract with the defendant for the original sum of $1,035,164, in which it agreed to furnish all necessary labor, equipment and materials, except those materials to be furnished by S&WB to demolish and replace the Central Yard Annex building. The contract required the work to be completed 180 days after the issuance of the required work order, but according to to the plaintiff also contained a subsection that allowed for the increase in the time of completion due to suspension, delay or interruption of the work for causes outside the fault or negligence of Wyman. The plaintiff claims to have been notified of a "Phase Two Work Order" that would start the clock on the job which would not be issued until phase one work order requiring a pile test was fulfilled. The plaintiff claims that the defendant issued a phase two work order more than a month before phase one had been completed and before the city had even issued a building permit. This was agreed to on March 7, 2012. Despite several events necessitating extensions in the project timetable that were not due to the plaintiff, the defendant is accused of wrongly putting the final acceptance of the work "on hold", and breaching the contract by failing to extend the completion date of the work on "bogus" grounds of it being substantially completed on that date. The plaintiff additionally accuses the defendant of failing and refusing to pay Wyman reasonable compensation for S&WB-caused delays totaling 584 days, and failing and refusing to issue the final acceptance of the work in conformity of the contract, among other things. The plaintiff is seeking an unspecified amount in damages for all equipment, material, and labor costs incurred by the plaintiff and any and all overhead and profit payable to Wyman, on account of any and all deals in the completion of the work attributable to the S&WB. any costs related to the S&WB\'s failure to issue a final acceptance of the work, any and all amounts attributable to any retainage which should have been timely paid, any and all damages suffered by the plaintiff as a result of the delay in the work, and any and all damages arising out of the impairment of the plaintiff's ability to obtain surety bonds for other construction projects.